Have you ever heard the phrase how you can have too much of a good thing? That’s sort of how I feel about Facebook’s move to add Community Pages. I understand it. It’s not that it doesn’t make some sense. But it feels very much like a case of execution before consideration. They thought it was a good idea, so they just ran with it. I’m a huge proponent of the idea that companies don’t own their brand, the consumers do. Brand is ephemeral. It’s an idea, a perception, an attitude, an emotion - all had by your customers. You can try to shape it, to mold it, but ultimately the only thing you actually own are your trademarks. One of the most immediate effects is that now, a quick search for Clark College doesn’t even turn up their main page in the top eight. That’s some fine SEO work there, Lou. I mean really, Facebook, you value an algorithmically generated page with 9 likers (?) over their established organizational page with almost 900 fans (screw it, fans is easier to say, and so I’m going to)? At least Lewis & Clark can sleep well tonight. Actually, most big players have nothing to fear in this instance, for whatever mysterious reason. It’s all the smaller players that really need the exposure the most that seem to have been overlooked. And sure, maybe that could be overlooked, except for one thing: the community pages are worthless. Let’s just call a duck a duck here. Big pages are just scraping and displaying information from Wikipedia, and small pages just do a regex match for people’s status updates and aggregates the hits. 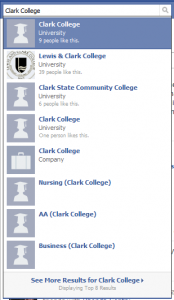 That has an obvious effect: the community page for Clark College is showing people mentioning Lewis & Clark College. And you know how I mentioned that big pages seem to fair the quick results storm okay? Don’t worry, Facebook has reserved the right to co-op your pages and turn over it’s development to the community, and there’s pretty much no information on what rules or standards apply to that policy, besides “If it becomes very popular (attracting thousands of fans)…”. This is what I meant when I said too much of a good thing. You can’t just open the flood gates and start creating pages algorithmically from the interests, et cetera that people are putting in. Something like this must be balanced, tempered. At least for now, fans of Clark College are now forced to do a hard search for their school if they want to actually engage with them. What’s to be done? At the moment, I can find very little, besides getting loud and angry. There appears to be no “flag this page as erroneous” feature, or anything like it. 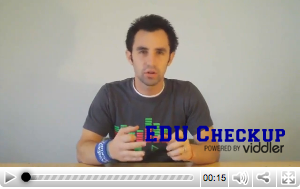 Write Facebook and explain your displeasure, and see if we can motivate the development of better checks and balances. I wouldn’t suggest signing up to be notified when they are ready for help building the pages yet, one because there’s no information on when that will be or what it will enable, and two because I’d hate to do anything that would appear to be supporting this process before there’s a clear path to how it’ll help us fix it. Social networking is a dance. You throw a party, help people get out on the floor, and get out of the damn way. People have a good time, they talk about that time you threw an awesome party, and you take credit for that couple that met there and got hitched later. Instead, Facebook has turned into that loud, obnoxious girl that spills her drinks on people and trips you when you’re trying to make your move on the cute girl with the Jimi Hendrix obsession. We just want you to throw an awesome party and stay out of the way, Facebook. I wish I could say there was a silver lining. I wish I had a bulletproof suggestion for how to make sure your brand management isn’t tossed to the wind. I don’t. Community pages are designed to be “dedicated to a topic or experience that is owned collectively by the community connected to it,” which is fine for pages about Pogs and brewing your own beer. It’s trouble for companies though. I doubt this story is anywhere near over. Michael joined Pittsburg State University in Pittsburg, KS (NOT Pennsylvania, they spell it wrong anyway) in 2006 and is currently the Director of Web Marketing. He is also CTO for the interactive map provider nuCloud. Web development's role in interpersonal communication is a principle focus of his efforts to improve and enhance higher ed web commodities. He is an active supporter of the dotCMS community, accessibility advocate, freelance consultant, frequent speaker at web events, and general purpose geek who wears many hats. Read his complete bio. I think what Facebook is trying to do is to get us to spend money. When I say that, it sounds kind of obvious, but look at the recent changes like that “promote” link from content we post on our page. They are trying to encourage us to drive traffic to our content with advertising, since we’re now competing in Search with all of these rogue community pages. The Community Pages, I suspect, are gearing up to be a lot more than they are right now, which is essentially a refurb Wikipedia. What I don’t yet understand is why it seems like Facebook is setting up parallel entities that will compete with one another. Brands versus customers? After FB fan pages have provided such a great opportunity for the two sides to commingle and connect? I just don’t get it. Maybe I’ll rename our fanpage “The OFFICIAL Tufts University Facebook Fan page,” a la many a Facebook group. First I respectfully disagree about branding. Yes its ephemeral and belongs in the minds of customers. But in my opinion, ‘Branding’ - much like ‘Marketing’ - has gotten a bad wrap. Mainly due to is sloppy and lazy misuse. Branding to me is an experience. You can act and operate a certain way that creates a mystique around you - your brand. Its like companies that do great integrated marketing (Mini Cooper, Harley Davidson, ZipCar). They create an experience and more so a *reputation*, something they dedicate to, adhere to, and work very hard to keep consistent. To me, that’s branding. And very worthwhile. As for Facebook. Screw ‘em. I’m really pissed about this. We all worked so hard to create communities to help students. We all pay money for FB ads. We work tirelessly on cross-content strategies to ensure the right people get the right information at the right time in the right medium and now, if we’ve not done enough or you’re new to finding us, you could very easily be confused. I think people will say ‘well, the best of the best will now be more obvious and it levels the playing field’. I’d disagree with this. This opens everyone up to major spam plays. What we saw with Facebook Gate 2013 groups will be nothing in comparison if merely the mention of your university is enough to rank high in the Facebook community page ‘mentions’ algorithm. All this has really done for us - and hopefully other universities - is made us all hold back going any deeper with Facebook and merely using our communities in much, much smaller ways. If it’s harder to be found, why not create your own social network? Bad move Facebook. The creation of these Community Pages is somewhat annoying, but the pragmatist in me says they are here, now how do we deal with it? The fact that it is now possible to see what people are saying about a brand on Facebook is simultaneously exciting and scary. Previously there was really no way to brand monitor status updates on Facebook. If you’re a college bemoaning the fact that constituents aren’t joining “official” pages/groups (general, alumni-focused, class of ___, etc.) think through your marketing and be proactive. My high school alma mater didn’t have an official Facebook page until yesterday when I set one up, specifically in reaction to these community pages. The official page is over 200 “likes” already and will likely top 500 within a week. (And this is a school that graduated 30 kids this year.) The Facebook Community Page for the same school? Five people. Proactive marketing makes the difference. And, for the record, I and a small team of other people at my college have signed up to contribute to the Community Page when that becomes an option, and whatever that ends up meaning. Good read here, Michael - thanks for addressing this. I know many of us in higher ed are very upset about these recent changes from Facebook. What it comes down to, I believe, is that Facebook doesn’t value a relationship with its users, and pretty much just doesn’t care about established content developers. If you look at all of the changes they have rolled out over the years, many have met with a lot of pushback from the end user community. These changes are decreed from upon high, and it seems as if no community input is solicited before making them. This latest rollout of community pages really underscores the fact that Facebook couldn’t care less about the companies and institutions that have worked hard to carve a place for their brand on the platform. To my knowledge, they didn’t ask for feedback, they didn’t show current page owners how community pages would work, and the documentation for how these pages are created, maintained, etc. is pretty much nonexistent. The way they’ve been rolled out and applied to profiles is inconsistent, and (as usual), Facebook makes it nearly impossible to provide feedback. I haven’t found a Community Page yet for my institution, but I’m dreading the day that it appears. Thanks a lot, Facebook. Imagine if Facebook were an employee at your institution. Instead of listening to your suggestions or thoughts, he would go on his merry way doing whatever he wants. He’d ignore any bugs in your site when you raise them to him because he’d rather do stuff he feels like doing, even if it’s stuff no one wants. My beef came when I found a community page for “Oswego State University.” That’s not the name of our college; it’s a misnomer that exists and we have been trying to tell people that we are SUNY Oswego. But this just helps that fake name persist and gives new traction. It’s not potentially in violation of any of its listed report conditions, so I can’t legally do much. Except I had to create a SUNY Oswego community page before someone else does and has incorrect information. We have a large and very active Facebook fan page, and since it has 6,000+ more members, I don’t think people are going to mistake it. But if the community page does start to get a following and has people asking questions, I would now have to monitor yet one more site to make sure people with questions receive accurate information. At least until Facebook’s next zany idea that will even further disperse our brand and community. Fan pages, groups, and community pages. Not only does it seem like Facebook is allowing the dilution of brands as you mention, but it also seems like they are diluting their own brand. They are trying to do too much and it is causing confusion. While there are obvious differences between fan pages, group pages, and community pages - I don’t understand why they don’t put all of the unique features together into one “fan-gro-comm” page (ok so the name needs a little work) and let the administrators choose the feature(s) they want on their page. As mentioned above, this will cause confusion and frustration with FB users too trying to determine whether they want to be a fan, a member of a group, or a community member all with the same name or similar discussions. They are doing exactly the opposite of what they are trying to create - they a diluting their community with the community pages. Next it seems like they will come up with something like “neighborhood” pages or “another word for group or community” and add page at the end of it with a slightly different feature to show off. Ok, I hope this made sense for a tired person on a Friday night rant. Remember Facebook network pages a few years back? When you joined a network, you automatically had access to the network page for that network. People would have discussions, post comments, etc. In the case of the network page for our college, the posts were a combination of students highlighting campus events and local business working their way into the network (via current students and local graduates) and promoting “Thirsty Thursday” etc. A college could not remove any posts, since they didn’t have admin privileges on the page. Regional network pages were much more chaotic. The removal of network pages likely improved paid advertising for Facebook. These new community pages offer the same potential advertising payoff. As they are currently set up, they also offer more extensive spamming opportunities. Simply mention the name of a community page in a status update and your item will be posted on that community page. I can’t recall anytime in the history of Facebook where bot-powered spamming has been this possible. Thanks for responding to my question so quickly, Michael. To make matters worse for us, there’s more than one Clark College (technically now known as Clark Atlanta University, but many people refer to it by its old name), so confusion abounds on our community page. I read Rob’s and Georgy’s posts with interest, too, and will try some of their suggestions, as well as your own suggestion of writing to Facebook. Do you have a specific e-mail address to suggest? I’ve never gotten a response from FB when I’ve tried to send them messages before. Although pretty much all of the internet social networks are inherently anarchic at lower levels, proprietary ones such as facebook are authoritarian at the higher levels (after all, it’s their brand). They have no obligation to protect your spin — or brand — from alternate opinions and information, and it’s not terribly important whether the information is accurate or not; good stories can make better reading than true ones. But branders should already know that. These community pages are also a privacy nightmare, and mean anyone not willing to forfeit their privacy must delete any mention of the schools they attended from their profile. Such a bad idea, through and through. This sort of thing makes me seriously question whether or not a social networking site can reach the level of integral importance to merit regulation in the same way utilities and spectrum are regulated.